Kell Brook knocked out Hector Saldivia to become the mandatory challenger for the IBF welterweight title. 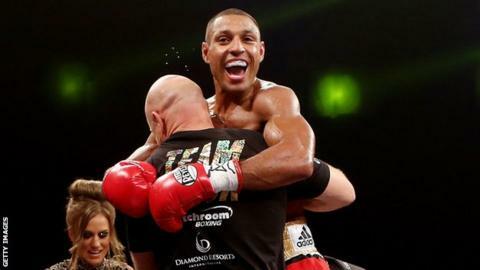 Brook, 26, predicted a "very tough" fight but was impressive in front of his home crowd in Sheffield to beat the Argentine in three rounds. Saldivia was troubled from the start and had no answer to his rival's power, with a savage jab ending the contest. The win extended the Briton's unbeaten run to 29 fights and edged him towards a shot at Devon Alexander's belt. Brook told Sky Sports: "It has been a team effort and I have done the hard work. I knew how I was feeling in the changing room and I knew I had done everything I could to get myself bang on. "[Previously] I was turning up thinking I could just beat kids, but you cannot mess about at this level. We had to get the job done. "I am very confident I can bring the title back home to Sheffield." In his last outing in July, Brook was given a fright by Carson Jones, winning a majority decision despite taking significant punishment from the American. In response, he drafted in a nutritionist as well as a strength and conditioning trainer for this contest, with his renewed commitment rewarded by a powerful performance against his more experienced competitor. Stung by the memories of his tight points victory against Jones, a lean and focused Brook attacked from the off and sent Saldivia crashing to the floor with a powerful uppercut in the first round. Brook continued his relentless onslaught in the second as he left his rival's face heavily bruised, his jab repeatedly breaking through a flimsy defence. Saldivia showed signs of a response towards the end of that round but his comeback was to prove short-lived as the 28-year-old was unable to recover from a straight shot at the beginning of the third. While a bout against southpaw Alexander - who claimed the title on Sunday by beating American compatriot Randall Bailey on points - is now firmly on Brook's agenda, the win also increases the likelihood of an eventual meeting with former world champion and fellow Briton Amir Khan. "I would love to take Khan's chin clean off and everyone knows I want to destroy Khan," Brook said.